Do you know who led the Tribe to an 11-3 record (including a win over UVA), a Semi-Final FCS Playoff game, and a #4 season-end ranking (the second best W&M Football finish of all time)? That would be one of the Tribe’s all-time greats, QB RJ Archer. 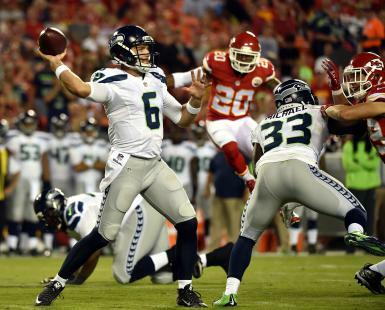 In his first full season as a starter, Archer threw for 2,778 yards, 16 TD, and 9 INT–a foreshadowing of great things to come. In that same season, he would lead the Tribe to the FCS Semifinals, where the Green and Gold narrowly fell in a heartbreaker to #2 ranked Villanova, 14-13. But this was still one of the best W&M seasons in recent memory; the playoff run included a huge victory over #1 ranked Southern Illinois, which earned the team a top-5 national ranking. Wow. We at the W&M Sports Blog were lucky enough to meet RJ at the Home Opener (W&M @ NC State) game this year, which ended with him graciously agreeing to do an interview with us. Below, we profile RJ’s decision to attend W&M, his time with the Tribe, and his career after William & Mary in both the NFL and the Arena Football League. Enjoy! We know you grew up in Earlysville, VA — right outside Charlottesville and UVA. Why did you choose to attend the College of William & Mary? 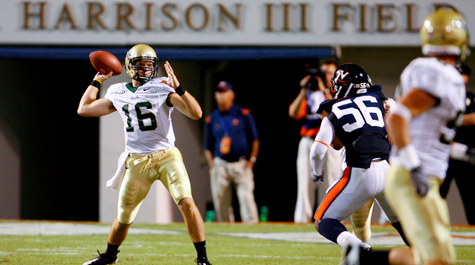 As W&M is known for producing scholar athletes: what did you major in at William & Mary, and why? It’ll come as a surprise to most Tribe fans that may not be familiar with your story, but you actually didn’t take over as the starting QB until your Senior season, and actually started your W&M career as a Wide Receiver! And let’s not forget to mention you finished second on the team in catches each of those seasons. 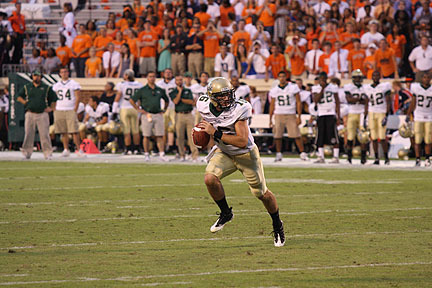 Could you detail your time at W&M as a Wide Receiver, and what that was like for you? Heading in to your Junior year, Head Coach Jimmye Laycock asked you to come back and play the Quarterback position. What was this like for you, especially as a successful Wide Receiver, who was also being asked to sit a year behind then-starter Jake Philips? 2009 was a magical season. Not only for W&M Football, but for yourself. In what was your Senior year and first as a starting QB, you amassed 2,778 passing yards, 16 TD, and 9 INT, while also adding 255 rushing yards and 5 rushing touchdowns. The team finished the year ranked #4 in the country, which was good enough for the second best W&M Football finish of all time (after ranking #3 in 2004). The Tribe would go 11-3, which included a huge win over in-state rival UVA in the season opener. Could you detail this game, as well as the team’s overall season and ensuing Playoff run? Following graduation, you were immediately signed as an Undrafted Free Agent by the Minnesota Vikings in 2010. Could you detail your experience with the Vikings, as well as the Detroit Lions (2012) and Seattle Seahawks (2015)? What has this NFL experience been like for you? Currently playing for the Jacksonville Sharks of the Arena Football League, we see that just last year, you finished with 4,661 passing yards, 92 TD, and 14 INT. Obviously, the AFL is a different animal, but those sound like pretty darn good numbers to us. How have you enjoyed your time in the AFL and how do you think it has it developed you as a player? Getting back to W&M: how have you managed to stay connected to William & Mary now that you live farther away from Williamsburg? And of course we have to ask…still at the ripe age of 29, is the NFL still your ultimate goal? After all, Doug Flutie did play in the CFL for 8 years before returning to the NFL at the age of 35. We at the W&M Sports Blog would again like to thank RJ for taking the time to do this interview, and wish him luck in his professional career, whatever that may be, moving forward! We’ll be rooting for you! LET’S GO TRIBE!! !